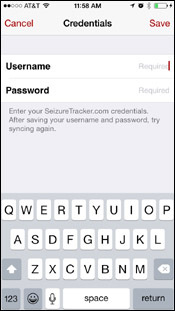 SeizureTracker.com - iPhone App is a revolutionary mobile seizure diary. 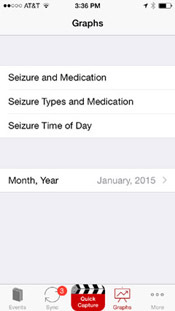 Logging seizures and keeping good records is an essential skill for managing epilepsy and it has never been easier! Renowned website, SeizureTracker.com is excited to bring you a "real time" seizure recorder that builds on the original Seizure Tracker experience. 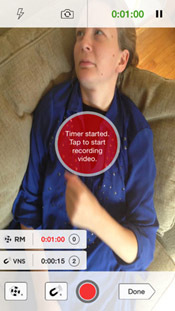 Users can time and videotape seizures simultaneously in this revolutionary and simple to use application. When you stop the video and timer, it immediately creates an event log that is stored in a seizure library. 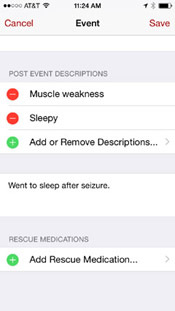 You can edit the event at any time to add additional details about triggers, seizure description and what happened afterward. 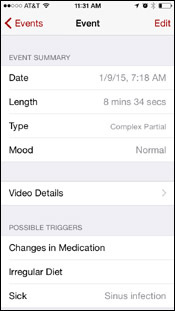 You can also use this app to log seizures without videos attached. This information can be easily synced to your SeizureTracker.com account. From there detailed reports can be created and shared with your care providers. Get a FREE SeizureTracker.com pen! Click here to find out how. Special thanks to Element 84 for developing this app! Visit the iTunes preview page by clicking here. 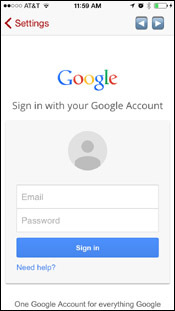 account to create detailed reports that are easy to share. Quick Capture Start Screen Quick Capture w/Video -Click "Quick Capture" button at the bottom of the main app pages to start recording a seizure. -Click the red circle in center of screen to begin videotaping. -If the rescue medication or VNS tools are active, you can press the icon buttons in the lower left corner to mark the time of usage. 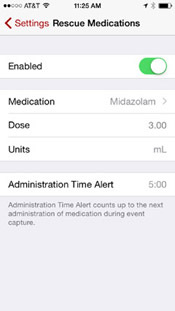 The timer indicator for those tools show you the time since the event began or when the last rescue medication administration or VNS usage occured. -When seizure ends click "Done"
-When finished editing text, click "Save"
Videos can be shared by syncing them to YouTube and SeizureTracker.com, email, or saving to the device library. - Select the "Video Details" option tthrough the event details page. - Syncronize to YouTube or watch the video using the red or green buttons. 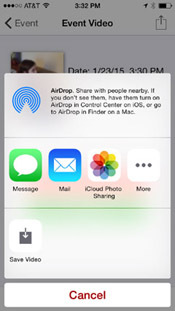 - Email or save to the device library by pressing the share button in the upper right corner. *Note: Emailing or saving the videos to your device library must be done before the videos are uploaded to YouTube. Those sharing features WILL NOT be able availible after YouTube upload . 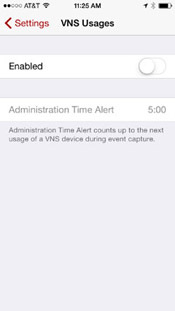 -For both the VNS and Rescue Med tools you can enable them here or adjust the "Administration Time Alert" to better personalize the administration alerts. What is the Administration Time Alert? As a part of the quick capture feature of the app you can record when a VNS Magnet was used and a Rescue Medication administered. The "Administration Time Alert" let you set a timer that starts from the beginning of the event and then alerts you when that predetermined time has been reached If the "Administration Time Alert" has been reached the timer turns red and continues to count up until the respective button is pressed or the recording ended. 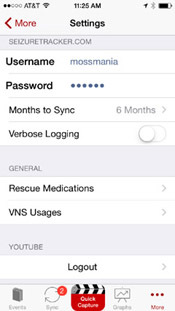 -Return to the Seizure Log sync page and confirm settings are working by attemping a sync. -The Rescue Medication and VNS usage librarries can be access here or moved to the main navigation menu. *Note: The sync length preference is part of the SeizureTracker.com creditials form. It is only accessible through the app setting page. *Note: If you are attempting to sync videos with your events and have not entered your YouTube user information already that form will appear first. 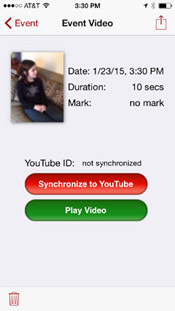 If you have already entered your YouTube user information the videos will be sync first and then you will be prompted to enter your SeizureTracker.com user information. Wifi must be available to sync events when any event has a non-synced video included. 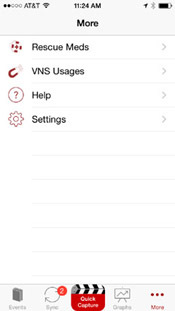 The sync length preference is only accessible through the settings page. The arrows will rotate while sync is in progress. You can follow what stage the sync is in by reviewing the scrolling text. "Sync Complete" will appear when the syncing process is done. 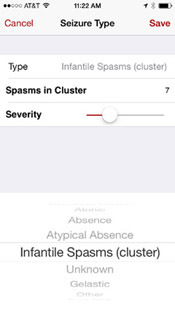 Graphs include: Seizure and Medication by day and week, Seizure Types and Medication by week, Seizure Time of Day. *Note: Clinking on the "i" button when viewing the "Seizure and Medication" graphs give you the option to change the scope of the graph. 2009 - 2019 © SeizureTracker.com All rights reserved.